Are you planning to construct a metal building but are concerned about mitigating summertime or keep the heat in winter temperatures? With the current climate changes hotter summers and colder winters it is becoming more difficult to maintain your steel buildings temperature. So what can one do to save money on maintaining the buildings temperature? For heat: A galvanized roof to reflect the sun rays off the building and a standard 3″insulation. 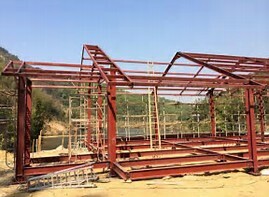 Add a cool metal roof. You can eliminate the bulk of this heat gain by installing a cool metal roof. These roofs are light in color and have reflective coatings that send a large percentage of the sun's UV rays back into the atmosphere and out of your home. Upgrade your insulation. If you live in an old building, upgrading your insulation will help to bring your building up to current energy efficiency codes in your area. Harness the benefits of ventilation. Adequate ventilation is another way to keep temperatures in your attic and living spaces to a minimum, and insulation and roof ventilation go hand in hand. For Cold A steep roof pitch to get the snow off and 6″insulation in the entire building to keep the heat in.